Mercedes-Benz has revealed the interior of the 2018 Mercedes G-Class. The next-gen Mercedes G-Class will debut at NAIAS 2018 in Detroit next month. The 2018 Mercedes G-Class has a clean, contemporary and a minimalistic interior design. The 4-spoke steering wheel, the analogue instrument cluster, the small central display and the cluttered centre console full of buttons have been done away with. 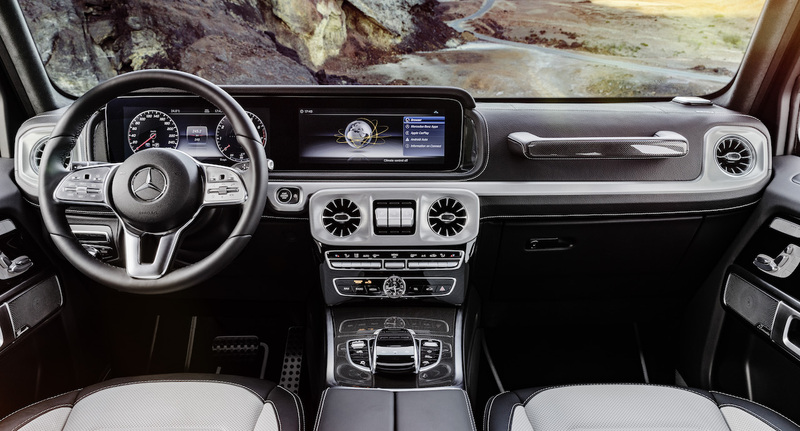 The next-gen Mercedes G-Class features a newly-designed 3-spoke steering wheel with touch-sensitive buttons, a wide-screen cockpit consisting of a 12.3-inch virtual instrument panel and a 12.3-inch central display, horizontal rocker switches for controlling the air conditioning and sporty air vents in a turbine-look. Mercedes-Benz will offer the dual-display setup in the 2018 Mercedes G-Class as an option. There are three style options for the displays - Classic, Sport and Progressive. The displays are configurable as per individual needs. As standard, the redesigned G-Class features tube-look analogue dials, something fans of classic round instruments will appreciate. The G-Class still has a grab handle for the front passenger and chrome-highlighted switches for the differential locks too. A 7-speaker audio system is standard, but there is a 16-speaker Burmester surround sound system with a 590-watt amplifier with Digital Sound Processing available optionally. With the redesign, the Mercedes G-Class’ legroom has improved by 38 mm (front)/150 mm (rear). The shoulder width has increased by 38 mm at the front and 27 mm at the rear. There’s 68 mm more elbow room at the front and 56 mm more elbow room at the rear now. Memory function for the driver’s seat, heating for the front and rear seats and luxury head restraints in the front are standard. The rear seats are foldable to 60, 40 or 100%. The analogue instrument panel is standard in the 2018 Mercedes G-Class, but there is an option for a fully-digital instrument panel. The 2018 Mercedes G-Class retains the boxy shape and the ladder-frame chassis of its predecessor, but with substantial changes. Its new aluminium body structure should result in significant weight savings. Mercedes-Benz is likely to offer the all-new G-Class with 2.9-litre in-line six-cylinder diesel, 4.0-litre biturbo V8 petrol and 3.0-litre in-line six-cylinder turbocharged petrol engines. The 3.0-litre petrol engine model is said to have a mild-hybrid system. The 2018 Mercedes G-Class’ production will take place at the Graz plant in Austria. Its market launch in Europe should take place in mid-2018.